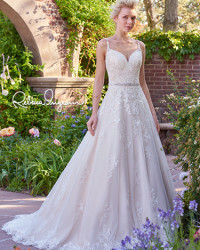 This enthralling silhouette features splendid embellished lace and tulle curving the hips and leading into beautiful fullness throughout the gently gathered A-line skirt. Scalloped edging frames the sweetheart neckline and bottom hem adding to the richness of this phenomenal style. Available with detachable halter strap accented with romantic handmade flowers.